This village straggles the busy road between Woodbridge and Snape; since the closure of the nearby American airbase, it is much quieter than it used to be, though when I came this way in late November 2011 I was pleased to see that the village shop was still doing good business. Across the road, and set back from it, All Saints sits quietly, with no tower to lead you to it from afar. At first sight, this is a simple, if uneven, little church, somewhat barnlike in its ancient graveyard. Tall elm trees around it are home to jackdaws and rooks; their cries fill the air as they wheel above you. A great yew carresses the south of the nave. The modern little porch gives no indication that you are about to enter one of the more interesting churches in this part of Suffolk. As you step down into the square south aisle and nave (in fact, they appear wider than they are long!) the first thing you notice is a pair of gorgeous Norman arches, one about 10 feet to the east of the other, at the base of what was once the central tower, although almost no indication remains of it from the outside now. Beyond them, the chancel opens up, its height accentuating the lowness of the arches which lead into it. Sam Mortlock argues that All Saints was probably a cruciform church, with the south chapel leading off from the south-east corner of the nave taking up part of what was a south transept. Cautley considered a tripartite arrangement more likely, largely on the strength of the arches only having mouldings on the western side. One of the lower tower windows can still be seen on the eastern face from within the chancel, and looks most curious. A bell rope disappears up into the ceilure. Although the western arch only has one band of chevrons, the eastern arch has two. If you look closely at the nave roof immediately in front of the western arch, you can see traces of paint, evidence of a one-time canopy of honour to the now-vanished rood. There is a small collection of medieval and continental glass in the chancel north window, including a fine scene of St Bridget feeding the beggars, and what appear to be the arms of the Borough of Great Yarmouth. Edward Hakewill carried out the restoration here in the 1860s. He is responsible for the angels on the wall plate of the nave. The south aisle isn't really an aisle at all, more a completion of the square between original nave and south transept. The south transept (if such it was) had been a chantry chapel, often referred to as the Bavents Chantry. Hakewill is also responsible for the fine west window, but the woodwork in the church is rather more recent, and an interesting story pertains to it. 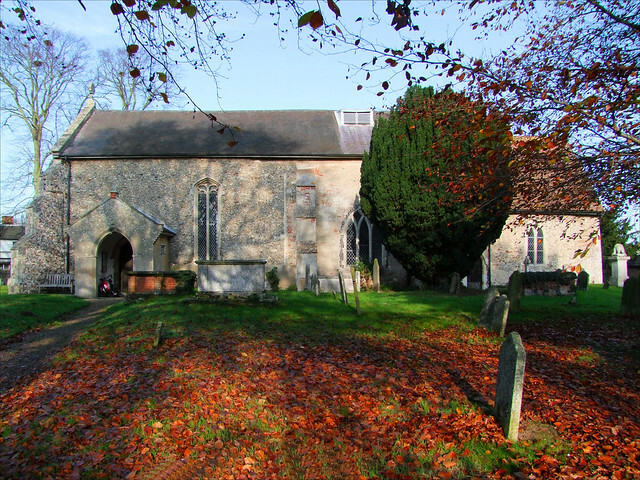 Like several other Suffolk churches, including Waldringfield across the estuary, a family dynasty of vicars was responsible for the Anglican revival in this parish. These were the Darlings, pere et fils. They held this living for 80 years, between 1859 and 1939. The father oversaw Hakewill's restoration of what had become a near-derelict church. The son, who took over in 1893, had a passion for woodcarving. He taught his parishioners the skill at night classes in the village school. Between them, the villagers produced the benches, font cover, organ case, chapel screen and reredos. If you look at the bench ends, you will find the Darling's pet dog, and some other unusual animals, including a squirrel and a penguin. The pulpit is Darling's memorial. The workshop's bench ends can be found in half a dozen other east Suffolk churches. The parish's most famous treasure, the 15th century Eyke key, is now in the British Museum. Its wards are shaped to make the word IKE, an alternative form of the village name. I was disappointed to discover that the doorlock has been changed since, but I suppose retention of the original would have made this the easiest of all churches to break into. A fibre-glass copy hangs on the wall. It pleased me to come back here after ten years. I remember that when I first visited this church on New Year's Day 2000, I was pleased to be the first person of the century to sign the visitors book. On that occasion, the nice lady practicing the organ told me that one of the Reverend Darling's daughters was still alive, and occasionally visited to see again her father's and grandfather's handiwork. I wonder if she still does?